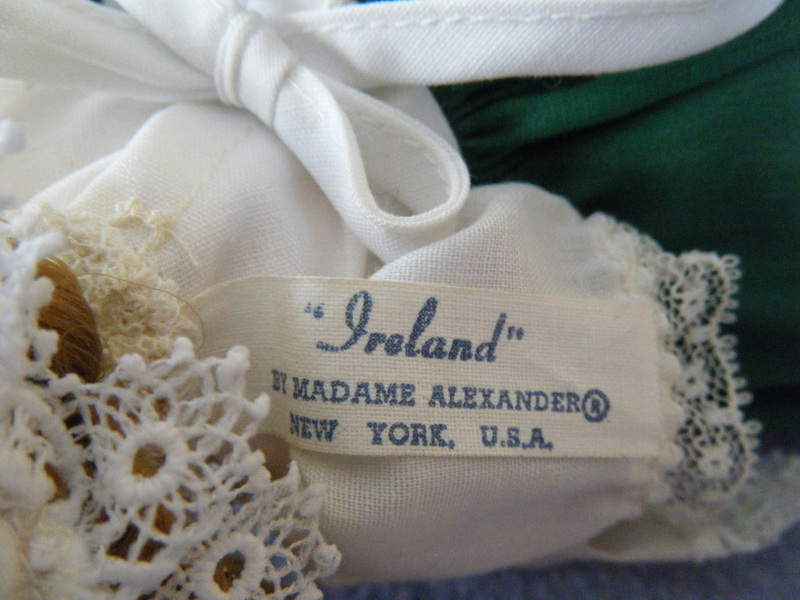 "Ireland" is a Madame Alexander doll from the early 1980's. She is part of an international line of dolls. My mother owns Ireland and was disappointed to find that her limbs had fallen off when she took her out of storage to display. This is a common problem with strung dolls - the elastic cords or rubber loops fail from dry rot. Rubber loops either turn to dust or become fused and sticky. Elastic cords lose their resiliency and stretch out. This is problematic because arms can fall off - causing them to lose fingers or shatter. 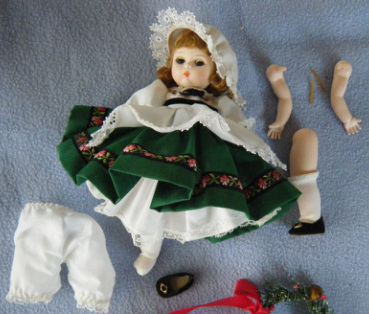 Fortunately, restringing dolls is a relatively easy repair and does not require too many tools. Restringing with rubber loops generally only requires a crochet hook or similar device. Restringing with elastic cords may require a hog ringing tool and a supply of rings. A second pair of hands is almost a must. Here is the state my mother found Ireland in when she came out of storage - both arms and one leg loose. The head and remaining leg were held precariously in position by a rubber loop that had fused together. The doll needed to be undressed and the broken rubber loops had to be removed and picked out of the formed hooks in the arms. A new loop was hooked onto one arm. A crochet hook was threaded through the shoulder holes and hooked onto the loop. The loop was stretched through the body cavity and hooked onto the other arm. The crochet hook was removed and the arms repositioned against the body. This is the finished product. 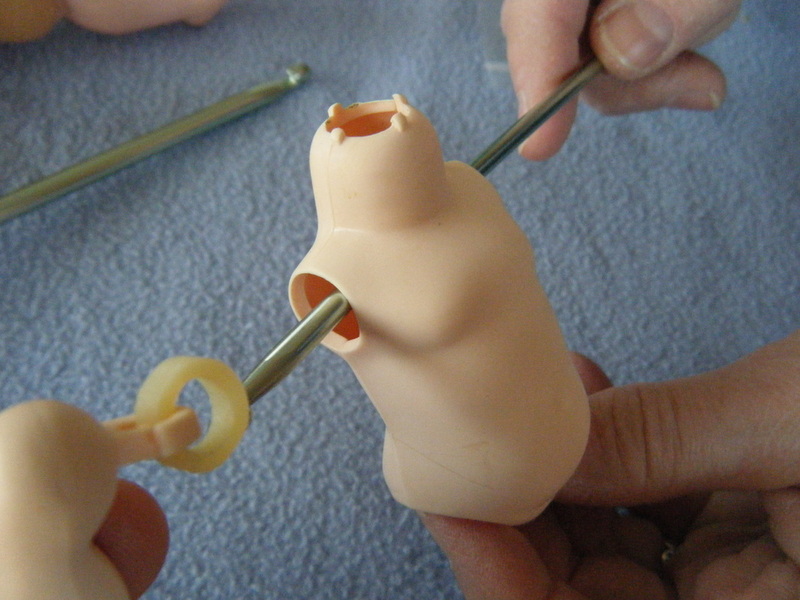 The two sizes of rubber loop used in the restringing process are placed next to the doll. The larger loop was the type used for the head-leg combo while the smaller loop was stretched between the arm hooks. Close-up of the official Madame Alexander tag. With the arms back in position, the next step was to restring the head and two legs with another loop. The old loop (visible in the photo) had to be cut from the hook in the head. A new loop was attached to the hook in the head and threaded through the neck and one leg hole using a crochet hook. One leg was attached to the other end of the loop. The crochet hook was then fished through the remaining leg hole and hooked onto one strand of the newly installed loop. The loop was stretched out of the body cavity and hooked onto the remaining leg. The crochet hook was removed and the doll was repaired. A fairly common problem with restringing doll heads is the doll's hair getting pinched between the head and the body. On this doll, the problem was compounded by her bonnet strap. We had to remove the bonnet in this instance. One of the tricky parts of restringing dolls is getting the tension of the loops correct. A loop that is too large or too thin may provide too little tension - letting the body parts droop or become unhooked. Loops that are too tight or too strong can rip hooks out of body parts or fracture brittle plastics around the hip, shoulder, and neck joints. The correct level of tension allows the body part to stay in position when posing the doll. Sometimes the desired level of tension can be achieved by doubling or tripling the number of loops used. I should note that regular rubber bands should not be used, they lack the physical characteristics and longevity of specialized rubber loops. Dollspart (www.dollspart.com) is a good source for purchasing the rubber loops used on modern dolls or the elastic cord used in antique dolls. The rubber loops come in 3 sizes and can be purchased in assortments.